In this last blog in the series I'm writing for Modemuze (find the Dutch version here) I'll go into creating a vintage look with the help of styling guides from the past. Women knew exactly what should be worn with what and when, all these rules seem quite unattainable to us. Still it is interesting to look at old guidebooks and styling advice, albeit more for inspiration and enjoyment than to strictly follow up on. 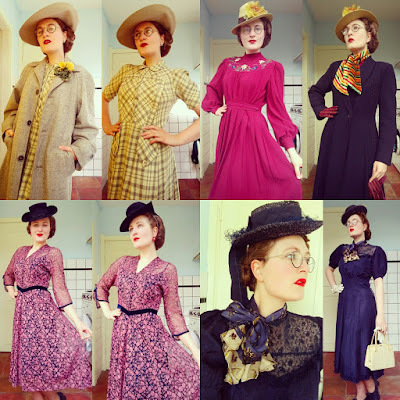 Most people wear vintage pieces as part of a modern outfit but some choose to go for a look that entirely fits into the style of a bygone era. This is my personal preference and I see it as a challenge to find ensembles that do not only look like they're from the same period of time but also adhere to the etiquette of the past. In general outfits were more 'matchy-matchy' than what we're used to today, but not neccesarily more 'ton-sur-ton'. 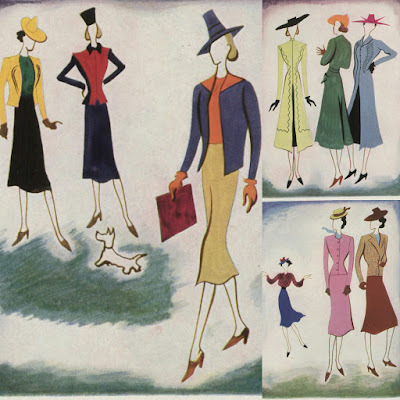 Contrary to what many people think (probably because so many black Sunday best dresses survived) bold and bright colors an color combinations were frequently used. Up until the 60's a woman of leisure would change several times a day. Mornings are for simple skirt and blouse/sweater combo's, whilst more dressy frocks and suits are reserved for afternoon visits. You could then change again for dinner, before WWII often in a floor length evening dress. Cocktail dresses came into use in the 1930's and are more versatile as they can be worn during the afternoon as well as the evening. Most vintage that has been preserved consists of the more dressy clothes as these would be the things people kept. Accessoiries were an important part of an outfit: a lady would not leave the house without a hat and gloves. The hat did not leave her head during the day and it was normal to keep it on in, for example, a restaurant or when visiting friends. Gloves were only taken off for eating. 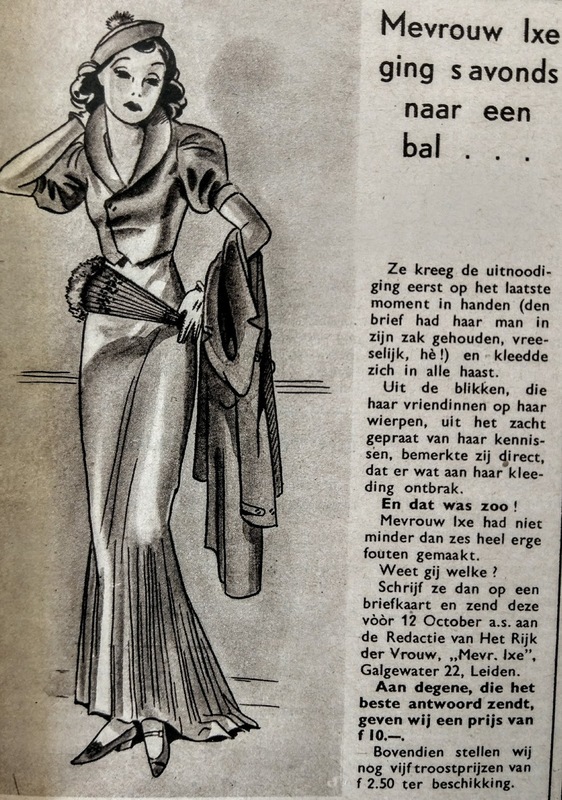 In het booklet 'Fashion and Style' fashion journalist Constance Wibaut writes one should sooner go out without a hat than without gloves. This is almost unimagineable for us and to be honest: I usually pick out gloves to match my outfit and put them on, but they disapear into my purse rather quickly because having them on all the time is cumbersome. What accessoiries were suitable for which occasion looks like a puzzle to us now. 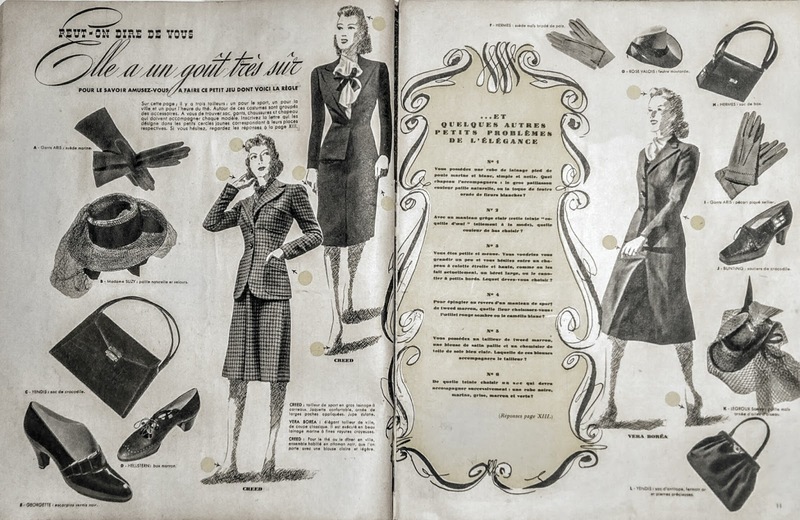 This page from Marie-Claire from 1940 makes a game of it: find the right accessoiries for each of the three suits. To the sporty tweed suit with parted skirt (left) belong the felt hat (G), the most sporty material and the only one without a veil, the shoes (D) and bag (H) made from box-calf (also 'sporty') and the gloves of pigskin. 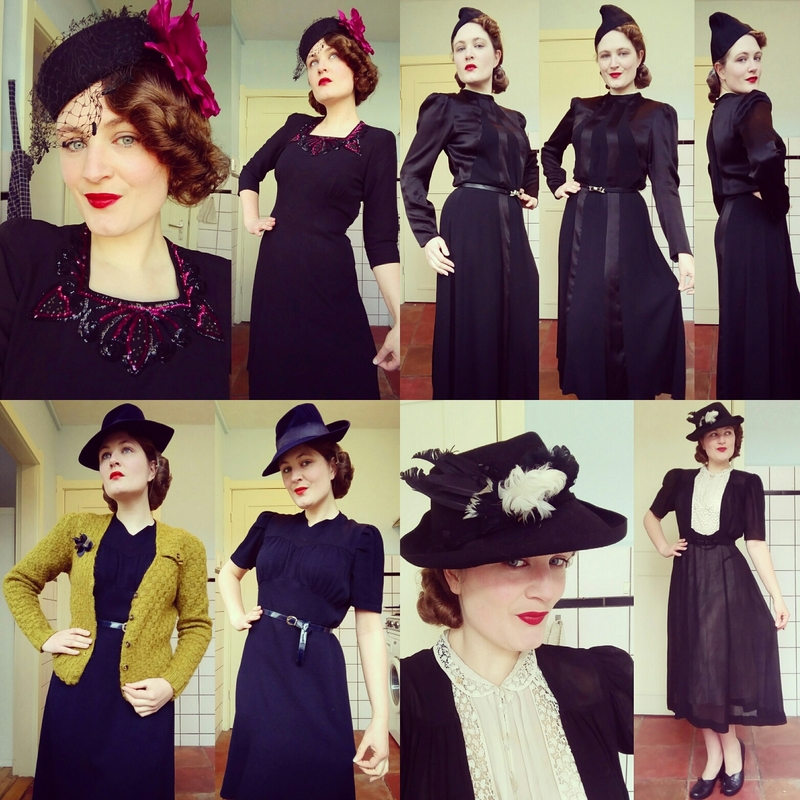 The black silk 'visiting' suit (middle) is well matched with the patent leather shoes (E), the handbag with bejeweled clasp (L), the mais yellow embroidered gloves (F) and mais yellow hat with 'birds wings' (K). In short the most fussy accessoiries. Also the gloves and hat are the same color. When buying accessoiries Constance Wibaut advises women to buy them to go with most of their wardrobe. Because clothing was more expensive than today even 'rich' people usually didn't own nearly as much as we do today. 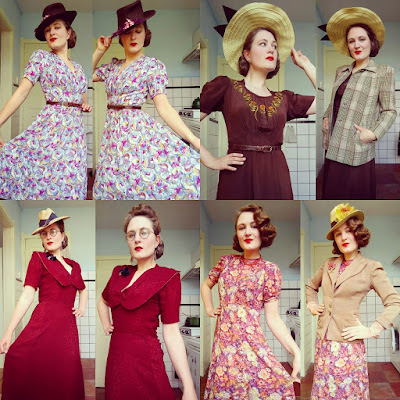 Her tip might be helpful when you start wearing vintage too, as you may find yourself with a limited wardrobe in the beginning. 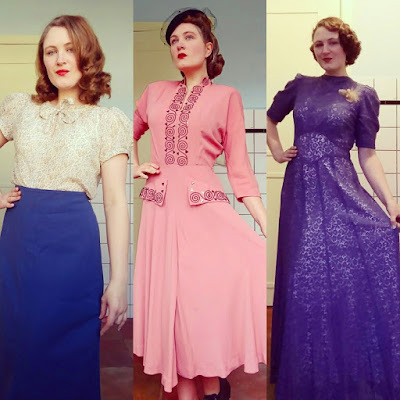 I'm not only inspired by sources from the 20-50's I also love to look at others in the vintage community. Social media like Facebook and Instagram play an important part in this. Eventhough most wearers of vintage have a thing for the past they tend to embrace these modern ways of communicating. It is the best way to find likeminded people from all over the world. Sharing what you wear makes creating a vintage look even more fun and also facilitates the sharing of knowledge. I'll end this post with another game. 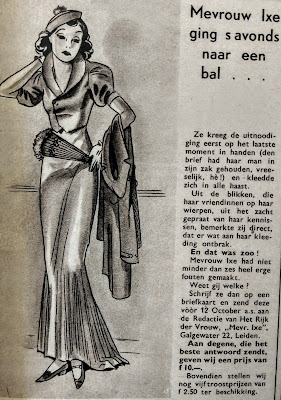 It is from a Dutch women's magazine from 1937. Poor Mrs. Ixe had to dress hastily for a ball and it shows. Can you spot the six mistakes? Will be back soon with regular blogs, planning on a post about some spring acitivities. great dress. looks wonderful. We have a great collection of African fabrics. Colorful and best quality at lowest price. For whole sell price Visit us, hope you guys love them.